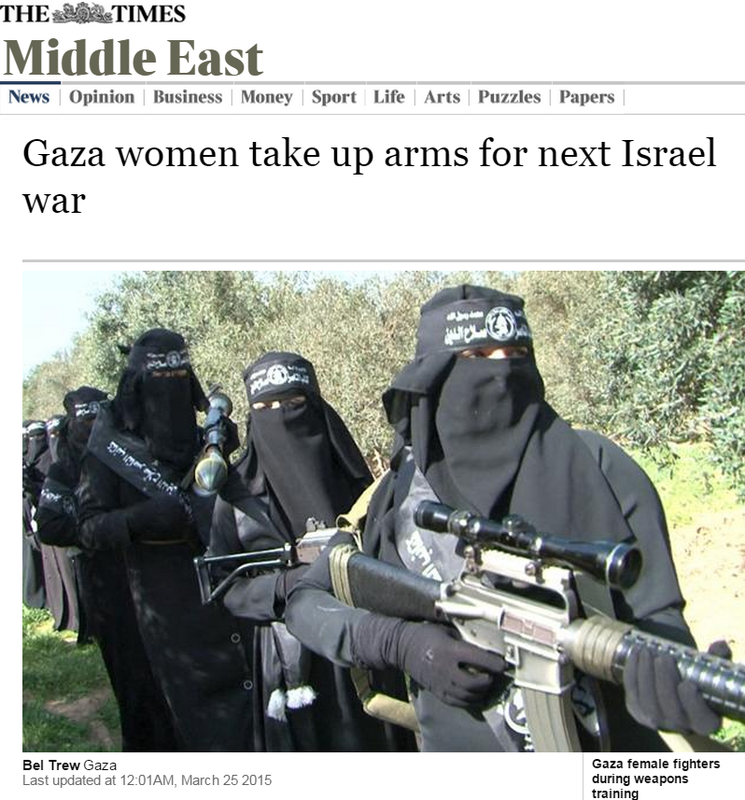 A UK Media Watch reader contacted us to complain about a March 25th Times of London article by Bel Trew titled ‘Gaza Women take up arms‘ (pay wall). Though the reader wishes to remain anonymous, he granted us permission to publish his thoughtful commentary. This Times of London article sets out what should be framed as the key problems caused by Hamas rule in Gaza, but instead the interviewer (Bel Trew) asks no pertinent questions of Hadifa, the female terrorist interviewee. This is a woman whose husband is a battalion commander, and who has sold her jewellery to buy an AK47. This is the perfect analogy for a “government” that squanders billions of dollars of international aid on terror tunnels and five-star Qatari hotels. The article makes repeated reference to the devastation caused by last summer’s war. However, it makes no attempt to question why there is so much money available for military purposes, for the “intricate network of tunnels”, yet no funds to rebuild homes, repair electricity and water supplies and generally improve the lives of the Palestinian civilians who are suffering. The point that should have been made is that Hamas creates an environment whereby the only way for Gazans to escape their troubles is to join a terror group. Only then will they receive a salary that can feed their family and gain access to better housing. Hamas is holding its people hostage as mere pawns in its endless jihad. “Gaza has not been rebuilt. We are prepared for fresh fighting to get our freedom,” Hadifa says. As if Gaza should just magically be rebuilt by some third-party? Why did the interviewer not ask: why don’t you help rebuild? If you sold your jewellery, why not use the profit to improve your living conditions rather than to buy a gun? Why choose death over life? Not only is she a young woman, a student – she is a mother. Does she not think of her children? I’m reminded of Golda Meir – “peace will only come when the Palestinians love their children more than they hate Israelis”. Clearly that day has not yet come, and looks further away than ever. Hadifa continues: “Think of it as revenge. People have lost everything and live in appalling conditions here in Gaza. Either you die pointlessly and slowly, or quickly with purpose”. Should the interviewer not ask why they lost everything? Should she not then highlight a third option – not to die, but to live? To oppose Hamas’ hate, to rebuild, to develop a peaceful society that would show Israelis and the world that a mature Palestinian state could one day exist alongside Israel? “Hamas recently dismissed a possible five-year peace deal, claiming that not enough of their demands had been met,” writes the Times of London reporter – a throwaway reference without any context whatsoever. There is no mention that it was Israel who offered this peace. No mention that Israel, as part of this deal, offered to lift key elements of the restrictions placed on Gaza, and to help with rebuilding efforts, if it could receive guarantees that Hamas would keep the peace. Should the interviewer not ask which of Hamas’ demands were not met? And why? Another point that should have been made: the article details that 17,000 homes were destroyed last summer and 2,100 Palestinians killed. Terrible death and destruction. Also, however, it’s an indication of the efforts of the Israeli military to avoid civilian casualties. Typically four, five or many more Gazans live in each home; if 17,000 homes were destroyed, the number of dead should have been 50,000 or more. Yet the figure is estimated at 2,100. And the bigger picture, as always – numerous hyperbolic references to the destruction in Gaza, but not one mention of why. No mention of the thousands upon thousands of rockets fired deliberately at Israeli civilian targets by a terror group which demands nothing less than the complete annihilation of Israel. The reader is left with the impression that Israel just periodically destroys thousands of homes and kills thousands of people for no reason whatsoever. And so the perversion of reality continues in the UK press. “It’s only a matter of time until the fighting starts again. We’re training and re-arming. We’re fully prepared,” says Hadifa. Yet you can be sure than when the next round of fighting starts, the international press will hound Israel as cruel instigator and villain. Do I have permission to post this comment on-line under my own pseudonym? the 3rd one seems to be wearing Michael Caine specs . That’s the one pointing the rocket launcher at the camera man . So, the gloves are off !.. or on? Quick! Someone tell Banksy that his next Street Art production could be sold for more ammo. Would that really bother him? could be mistaken but the 4th one looks like she has her bandana over the eye slits and cant see a thing either . what is this military unit ? Ophthalmic Resistance ? A good idea to require a password for posting a comment. This will make the identity theft seen in the past weeks impossible. Islamofascist canon fodder. And The Times is right there.